When we posted the Munchkin Mat of Mayhem for preorder earlier this summer, we had no idea just how many Munchkin players would want it. After the preorders closed, we were flooded with "how can I get one?" requests . . . so many that we have opened the Mat of Mayhem for a second round of preorders! 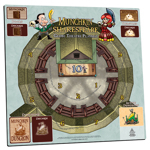 Additionally, we've designed a Munchkin Shakespeare Globe Theatre playmat and a playmat for use with The Good, The Bad, and The Munchkin, both of which are also open for preorders until September 4. That's three different Munchkin playmats, each a cloth-backed neoprene gameboard that you can roll up and take to your next game session, all shipping in October! We have no idea if we'll open these for preorder again, or just how many will be left for sale after we fulfill the preorders, so please take advantage of this opportunity now, because we may not see these designs again for months (if ever).